Your day-by-day itinerary now includes Benaki Museum, Goulandris Museum of Cycladic Art and Parthenon. Deepen your sense of the past at sights like Acropolis of Athens and Temple of Hephaestus. Escape the urban bustle at Mount Lycabettus and Attica Zoological Park. Go for a jaunt from Athens to Vouliagmeni to see Astir Beach about 40 minutes away. And it doesn't end there: browse the eclectic array of goods at Monastiraki, stop by Olive Tree - Ελιά Olive Wood Products, admire the masterpieces at National Archaeological Museum, and delve into the distant past at Erechtheion. 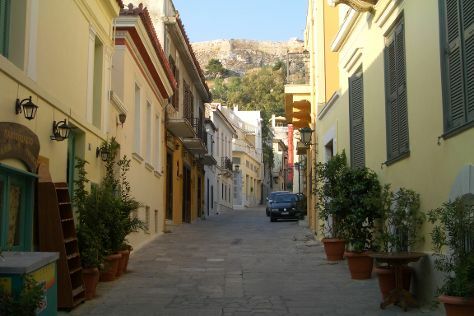 For reviews, ratings, traveler tips, and other tourist information, go to the Athens itinerary planner. Expect a daytime high around 29°C in May, and nighttime lows around 20°C. Finish your sightseeing early on the 28th (Mon) to allow enough time to travel back home.